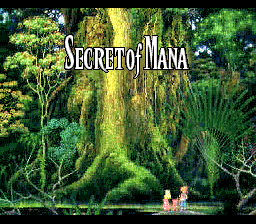 Secret of Mana Relocalized has just been updated to v1.6! v1.7. - Changed "Raring to go!" to "Ready for a fight!" - Changed "Burned out!" to "All tuckered out!" - Changed "Enemy wimps out!" to "Ha! Buncha' wimps!" - Changed "Won't fit!" to "doesn't fit." - Fixed "I'm was born in the Empire..."
- Fixed minor text oversights. - Changed casing format that caused "'s Poisoned!" to display as " P". - Fixed Action Grid text bug. - Fixed crash that occurs from trying to skip naming a character. - Mixed case character naming now possible. - Removed the last remaining reference to Popoi's gender in the script. - Spell descriptions have been updated to allow for room for statistical data. - Reverted back to old punctuated message system. - Miniaturized was to long. It's system message was changed to "Shrank!" - Miniaturized's status was changed to "Shrunk". - Unconscious was too long. It's system message was changed to "Asleep!" - Unconscious' status message was changed to "Asleep"
- Burning's system message was localized to "Ablaze!" - Burning's status was localized to "Ablaze". - Gigas whip was corrected to Gigas' Whip. - Diamond Missile was localized to Diamond Shards. - Freeze was localized to Ice Smash to match later entries in the series. - Detect was localized to Analyze for comprehensiveness. - Sleep was reverted back to Sleep Flower because the change was unnecessary. - Dispel was reverted back to Dispel Magic because the change was unnecessary. Looks impressive! 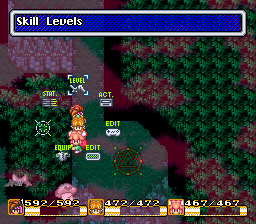 By the way, I recognize Bagunagu as Bagh Nakh, which are in Star Ocean 1, if you were curious. 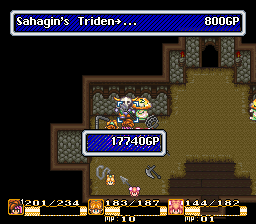 I just don't understand how Bagh Nakh becomes a throwing weapon. It's one of those instances in this where even the very wonky and meaningless localization makes more sense. Rest of it looks good, though, and I look forward to the final output. Minish is also an archaic form of the word "diminish", I stuck it on the hammer because it has consonance with Hammer.If people prefer, I can absolutely switch it to something else. Unfortunately, FuSoYa's VWF script isn't so easy to divorce from his VWF code. That code is absolutely necessary for playing the game. After comparing the original translation, FuSoYa's expanded version, and the HD Remake's translation side by side, I can tell you that FuSoYa's expansion isn't terribly far off the mark in terms of what was intended. Any preference on replacing the word "Buster" for "Slayer"? I just wanted to point out that "fiery" is actually spelled correctly. My apologies, Kiyoshi Aman. Below is a link to an explanation as to why. Holy hell! I just realized that I've been using your translation guide for my hack Kiyoshi Aman. It's been incredibly helpful. Thank you for your efforts. Btw I think I just solved what I've been calling the Kimono Bird puzzle. It used to drive me crazy that the Ultimate Bow was called the Garuda Buster when Garuda aren't really featured in the game. Then I realized that they actually were. The Kimono Birds aka Garasha are not actually reference to Gracia as Sky Render has theorized. I think Garasha is one of those tricky Japanese contractions of the words Garuda, the afformentioned mythological eagle men, and Rasha which means felt or woolen cloth. The Garasharam or Kimono Wizard is the same phrase but with ram (lamb) tacked on at the end. No, it actually was misspelled; it was just corrected by the time you had a look. You're welcome. And yeah, that's definitely a possibility. Go for it. 'Slayer' gets the idea across better. I thought I better drop a little update. I finished my preliminary bug testing. All that's left is to modify the game's credit sequence a little bit and last but not least the game's critical hit dialogue. 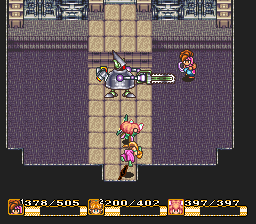 You may remember it as "Rabite gets Whacked!". As much as I want to change it from "_gets_Whacked!" to "_is_Critically Hit! ", I cannot. Because of spacing limitations, I am limited to the original 14 character limit. 1. Change Nothing. "Rabite gets whacked!" is Ted Woolsey at his finest! 2. Modern Update. "Rabite gets Rocked!" for a more serious take! 3. More Modern Update. "Rabite gets Wrecked!" for a sillier take! (I cannot justify using as our spelling "Rekt! ", Sorry Internet). This is not a contest and these are not votes. I'm just getting feedback, some of which comes from offsite sources. That said, I'm looking for responses ASAP. I'd like to be done with this thing completely before the night is over. Clocks ticking. Keep the Woolsey style there. They all sound about equally terrible, so I'd leave it unless you can come up with something significantly better. Agreed. The Woolsey style is the best for me. For all of it's limitations in retrospect, at the time there was a certain charm to Ted Woolsey's work in the translations. Which is absolutely why we're keeping "whacked". Just to give a little status update. I don't have as much time to play through the game as I do to edit it, so bug testing is taking longer than anticipated. Bug testing progress is slowly being made. Good thing too, because it turns out that most of FuSoYa's opening lines for Gemma (formerly Jema) take up the maximum displayable width. Expanding his name exceeds that in many places. I've been fiddling with the text quite a bit. I decided that I wanted to make the game's items match up with the graphics. So, items like the Quill Cap will be called the Bunny Cap. The Spear/Lance Javelin/Spear thing is getting an update as well. When playing through the game I've found it very difficult to call the Lances by the proper Japanese name because in all but two cases, they aren't actually lances. They're Pikes. Unfortunately, Pike simply isn't a common word these days and Spear is more of an all encompassing word including Pike, Lance, Javelin, Pilum, and numerous other pointed sticks. My current thought to make the images and descriptions match is to eliminate Spear from either weapon category and instead call them Polearms and Javelins. Afterall, Halberds, Partisans, Spears and Lances are not all considered spears or lances but they are all considered Polearms. While the same cannot be said of Spears, Forks, Pilums, Tridents, and Javelins, they are all common throwing Spears and the most commonly used term for throwing spear is Javelin. All of this and more will be updated in the original post. Now, about the Cobra Shuttle. I'm still kind of torn on this one. In Japanese it's called the Bagh Nakh which translates to Tiger's Claws in Hindi and is a hand held claw weapon. Both names are meaningless and stupid. Graphically, the weapon is a Kobari Ryu Manji Shuriken or Kobari School Manji Shuriken. While "Manji Shuriken" is the best possible name for the weapon the Manji prefix makes it seem special and more significant than the stronger and more plainly named "Shuriken" weapon. I see two answers to this problem. We can call it the Cobra Manji and be done with it or we can rename both weapons more specifically, calling them the "Manji Shuriken" and "Hira Shuriken". I've opted to rename both but as always I would love to hear feedback and criticism. Finally, I've made one gameplay change. It doesn't affect the balance of the game at all. It's more of an easter egg really. You can find this little gem in one of the game's item shops. Does anyone know how to modify the "...->" text when upgrading weapons? It seems there is some preset spacing for all of the weapons. On some weapons it's all the way to the right. On others, it cuts off the weapon's name. It looks terrible and I really want to fix this before releasing this patch and moving onto adding the hd re-translation. On another note. I'm almost done play-testing and making fixes. I'll be releasing a beta in the next few days with or without a fix. Side request: Does anyone know what the code directly following Neko's shop in the grand shrine is for? I'd like to expand his shop by one or two items for a little side hack and I need one or two extra bytes to do it. The two bytes in question start at 18FCFB. Honestly, I wish I could answer these questions myself. Does a more well documented ROM map than datacrystal's exist somewhere that I'm not aware of? Since it doesn't display in the same place for each weapon, I guess the position for each must be stored somewhere rather than being one hardcoded address. Should be relatively easy to track down using a debugger, unless the game does something really wonky. Wasn't actually a problem in the game's dialogue. I did however fix it in the changelog. I believe I fixed this problem. I believe it was a bug caused by giving weapons' names longer than 16 characters. In other news. I just released a beta for testing. You can find in the original post of this topic.